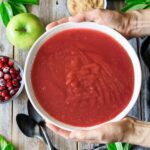 Spiced cranberry applesauce is a quick, healthy side dish recipe that you can serve with pork or latkes. 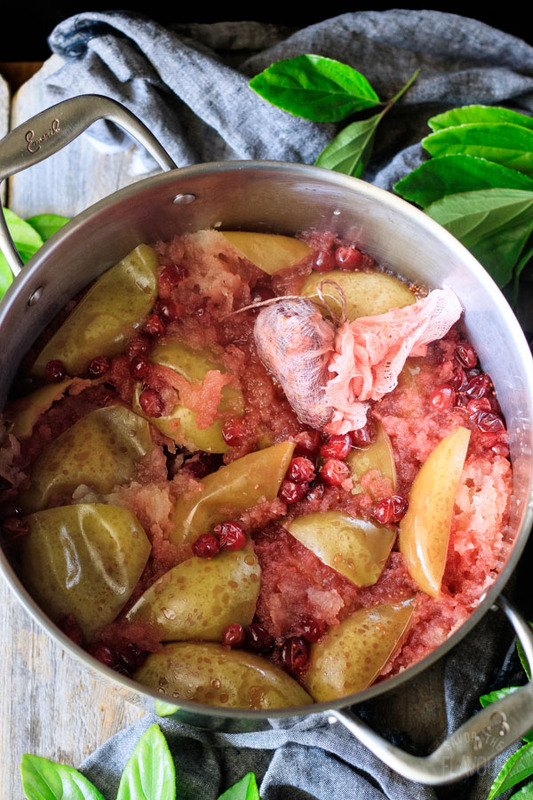 Learn how to make this stunning holiday applesauce on the stovetop or in the crockpot. 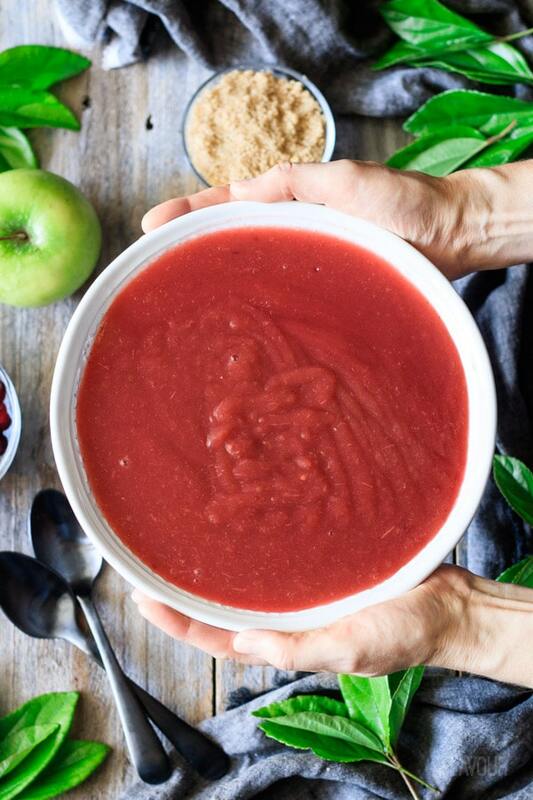 The cranberries take this simple, low carb applesauce to a whole new level. This post was originally published on October 12, 2017. 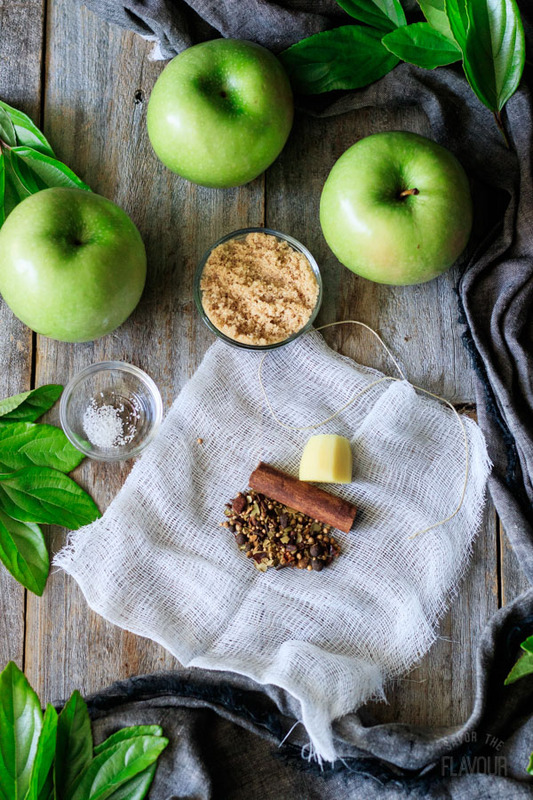 Looking for a new twist on homemade applesauce? 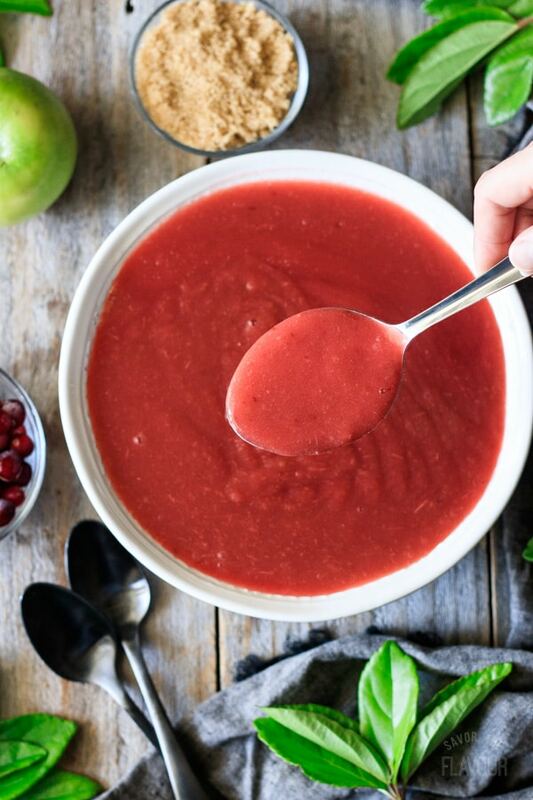 Try this spiced cranberry applesauce. It is a delightful change to unsweetened applesauce. You’ll love it with baked ham, pork chops, latkes, turkey, or just by itself. 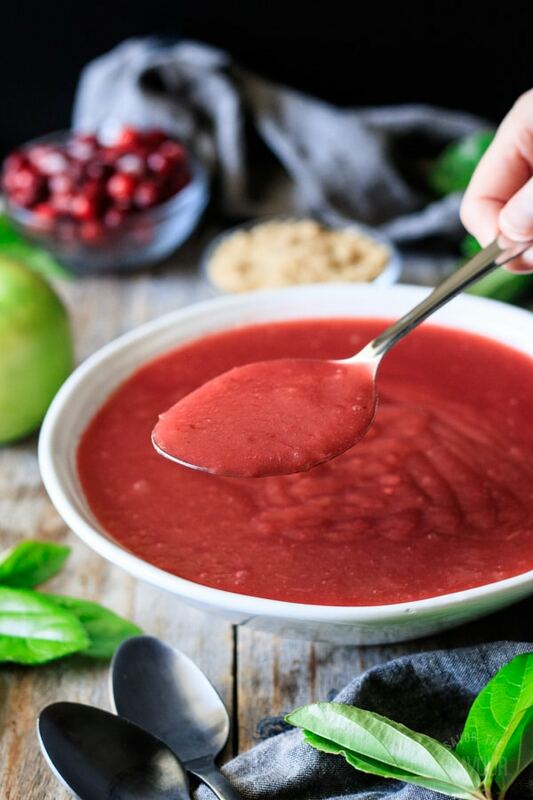 The cranberries give the applesauce a gorgeous jewel color, which is very welcoming during the holidays of Thanksgiving, Christmas, and Easter. How long does spiced cranberry applesauce last? It will last 10 days to 2 weeks stored in an airtight container in the fridge. You can freeze applesauce for up to two months. First, cool completely on the counter, then pour into an airtight container. Remember to leave a 1/2 inch headspace to allow for expansion. What apples are best for homemade applesauce? What do you eat applesauce with? Does applesauce go bad in the heat? Since homemade applesauce has no preservatives in it, it is best to not to keep it out for more than two hours. Refrigerate or freeze any leftovers from a holiday meal. How can I make spiced cranberry applesauce in the slow cooker? Core and quarter the apples (no need to peel them) and place in the slow cooker. Make the spice sachet. See below for pictures. Add the fresh or frozen cranberries, apple juice, apple cider vinegar, brown sugar, and kosher salt to the slow cooker. Stir to combine. Nestle in the spice sachet, cover the slow cooker, and cook on high for 4 hours, stirring twice. Remove the spice sachet. 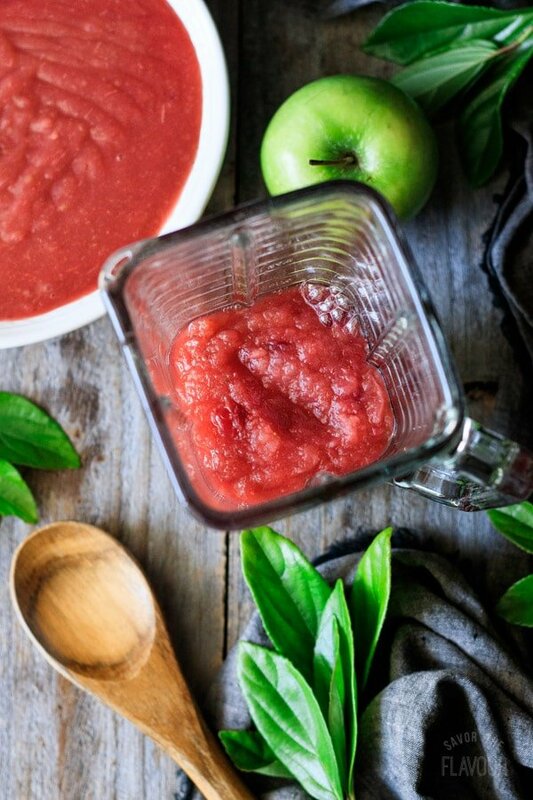 Puree the applesauce with an immersion blender, food processor, food mill, or blender. To make the spice sachet, cut a square piece of cheesecloth. Add 2 teaspoons of pickling spices, one cinnamon stick, and one inch of peeled fresh ginger. Gather up the ends and tie it securely with a piece of kitchen string. Prep the apples by washing, coring, and quartering them. Place the apples, cranberries, brown sugar, and kosher salt into the pot, then stir in the apple juice and apple cider vinegar. 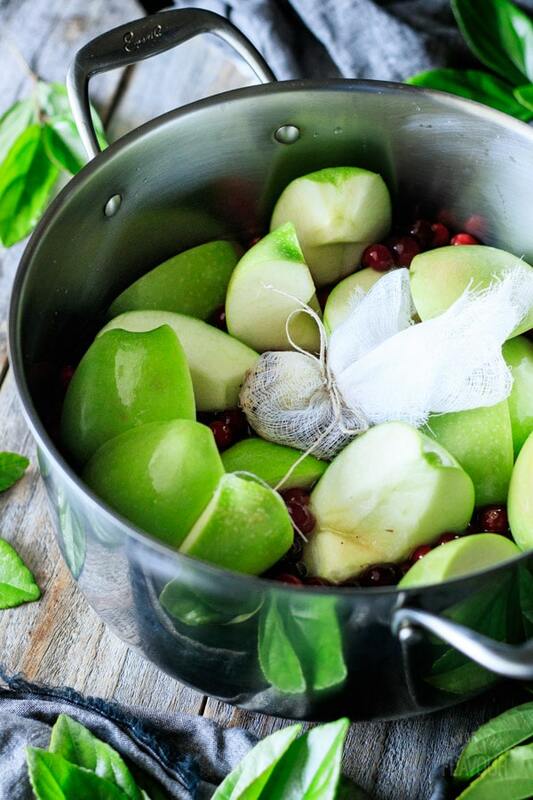 Nestle the spice sachet into the apples, then cover and bring to a boil over medium high heat. Turn the heat down to medium low, and let the apples cook for 20 to 25 minutes or until soft. Puree the apple cranberry mixture in small batches in a blender, food processor, immersion blender, or food mill. Serve warm or cold with baked ham, pork chops, latkes, or just eat by itself as a snack or for dessert. 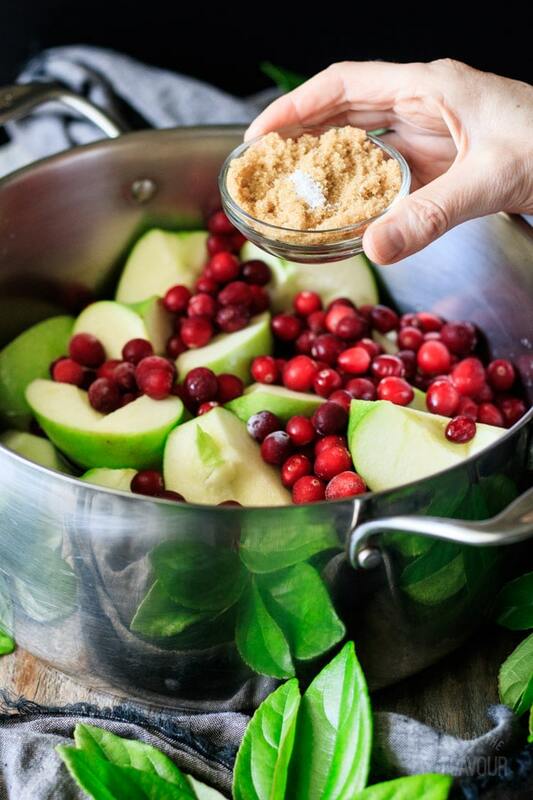 This spiced cranberry applesauce recipe is a pleasant twist to traditional applesauce. 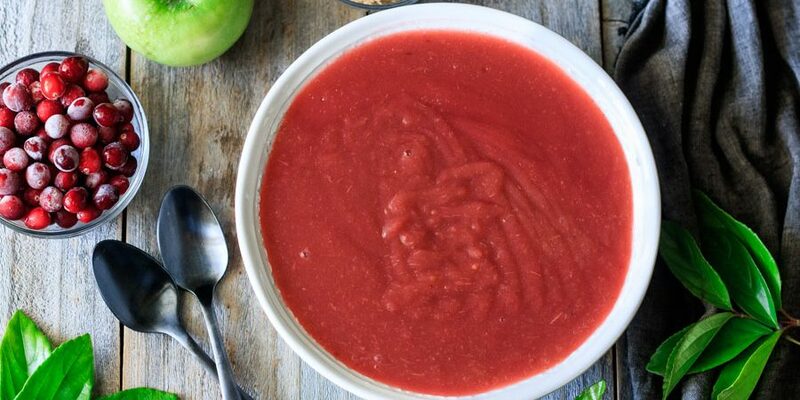 If your kids love applesauce, you’ll have to try this! Don’t have any apple juice? Use apple cider, cranberry juice, or orange juice. Want to subtly change the taste? 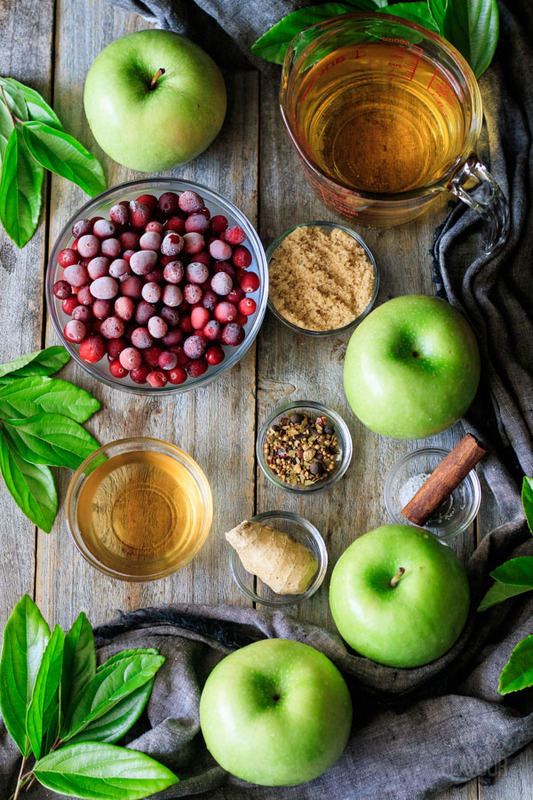 Use more than one kind of cooking apple. No time to puree? If you want a chunkier version, mash with a potato masher or the back of a large slotted spoon. Remove peels. Want other add-ins? Try strips of orange and lemon peel. Don’t want to add sugar? Cook it without. If necessary, add one tablespoon of your favorite sweetener after it’s done cooking. Leave the skins on the apples. It makes it easier, quicker, and provides more fiber – just make sure to puree. Is your applesauce too watery? Leave the lid off and let some of the liquid evaporate while the pot simmers on the stove. Looking for an edible gift? Make up a few jars and give out to friends. 1 pound of apples is equal to 2 large apples, 3 medium, or 5 small apples. Having a dinner party? Serve the spiced applesauce in small ramekins for each guest to use with their pork. This cranberry applesauce would taste great with these other dishes. 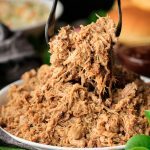 Slow Cooker Pulled Pork: it’s easy to cook this pork until tender and flavorful. How to Cook a Turkey: moist roasted turkey is an easy and economical main course. Ham and Peas Bow Tie Pasta: ham, peas, and pasta tossed in a delicious creamy sauce. The pleasure of a 5-star review of this spiced cranberry applesauce would be greatly appreciated. Cut a piece of cheesecloth large enough to hold the spices. Lay the cinnamon stick, pickling spices, and fresh ginger root on the cheesecloth, gather up the corners, and tie securely with string. Add the quartered apples, cranberries, brown sugar, apple juice, and apple cider vinegar to a Dutch oven set over medium high heat. Mix until combined. Place the spice sachet in the pan, cover, and bring to a boil. Then, turn the heat down and simmer for 20-25 minutes, until the apples are very soft. 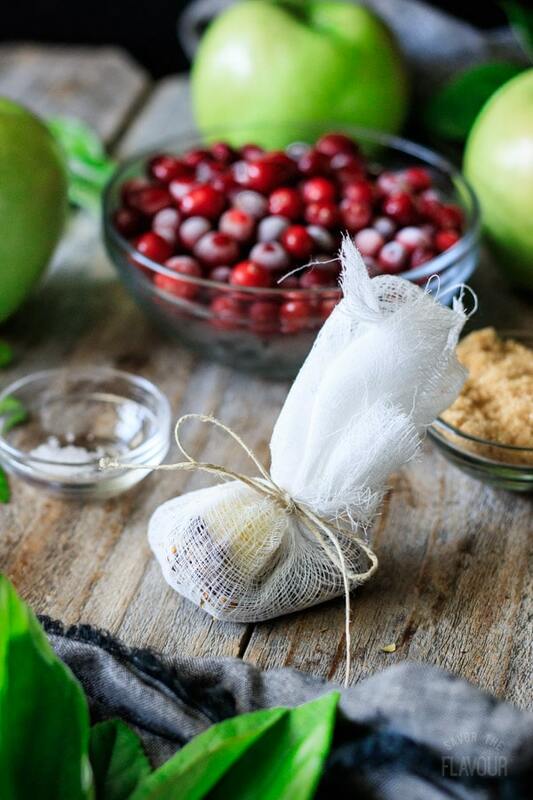 Discard the sachet, then puree the apple-cranberry mixture in a blender or food processor until smooth. Do it in a few batches if you don’t have a powerful blender. Pour the spiced applesauce into a serving bowl and serve warm with a baked spiral ham or pork chops. The pleasure of a 5 star review of this spiced applesauce recipe would be greatly appreciated.